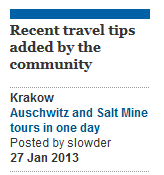 This little travel tip popped up alongside an article on the Guardian’s website. After overcoming my uneasy feeling at the casual juxtaposition of these two tours, and the advertising pitch urging you to save by enjoying both in one package, a quick search on Google turned up numerous similar offers. 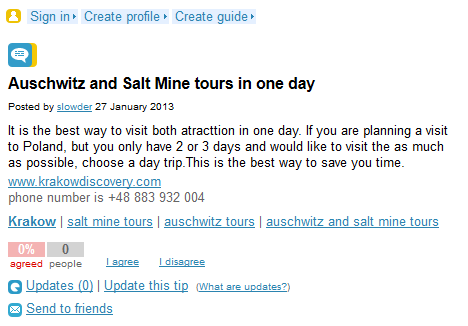 There is apparently a thriving tourist business in and around Krakow (with several companies like Krakow Discovery competing for the tourist Euro) offering tours with experienced drivers to make sure no-one gets left at Auschwitz and, it seems, a low-cost way to overcome the impact of the concentration camp experience by viewing the famous salt mine, a UNESCO Heritage site in one day at one low price. This is a strange example of “the banality of evil” – who in Auschwitz could have imagined that their death camp would one day be coupled with a money-saving offer to visit a famous underground World Heritage Site? What is next – a money-saving day trip to a Rwandan massacre site coupled with a safari, with experienced drivers? But perhaps the Guardian should be a little more selective in allowing its readers to offer such ‘exciting’ and ‘valuable’ opportunities to its “community”? Can Auschwitz really be described as an attraction? Reminds me of the structures and monuments created by Muslim invaders across India in celebration of their bloodcurdling murderous victories over and subjugation of the native Hindu population that are now touted as tourist attractions by…wait for it…Hindus. It’s like watching a wildlife documentary where a pride of lionesses is shown munching over a carcass of some wildebeest that they’ve just killed while other wildebeest are stood around only a few feet away chewing grass. No difference between unintelligent animals and humans, really. What next? How about a Disney theme park where the visitors can actually experience all the thrills and fun of a concentration camp. Dear Mr Levick, as a matter of fact, all travel agencies in Rwanda offer the same tour: visit of the genocide landmarks + hiking with gorillas in the forest. You could find a job as a gorilla, “nat”. Nah, a rat fits you much better. SerJew, something tells me that you’re not the kind of person who’s able to go on a trek to observe gorillas in the Rwandan forest. Nat has a point here. This is morally wrong in Rwanda and Poland. Nat, so you do know something about Rwanda. Don’t compare the natural world to the human world. The Lions take what they require and it’s normaly the weaker which will be removed. In human societies things are very different. By applying our values onto the animal’s world things seem twisted. In fact it is us, who apply those values out of place, who are seeing a perfectly normal thing as twisted. The same happens when we try to apply animal values onto human societies, thus stepping away from socialism and retracting back into anarchy or dog eat dog. Are we referring to…er…what, the Taj Mahal here? When I visited Zanzibar, we did a tour that covered a slave hole (can’t recall the official name, but a hole in the ground the size of an average double bedroom, where the Arabs kept hundreds of slaves prior to auction) followed by dolphin spotting. I literally just lowered and clasped my forehead in the one hand and said “f****** hell” on reading that promotional line. Although – sadly I bet there are similar “deals” covering e.g. the killing fields of Cambodia.